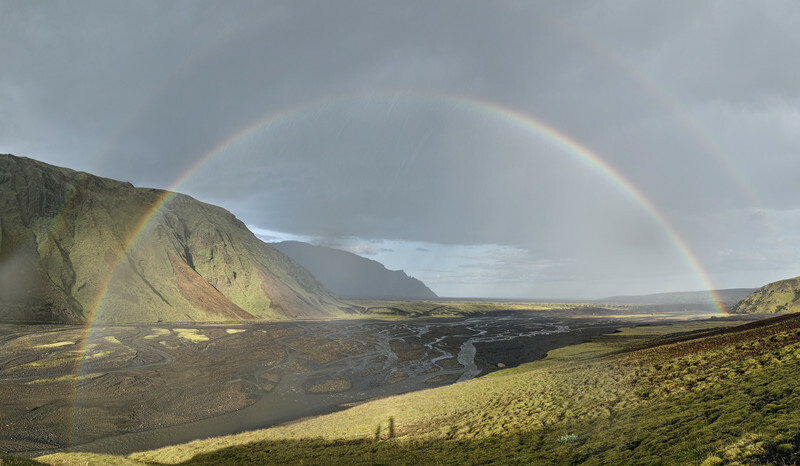 Another impressive weather composition (or rather two) from our summer holiday in Iceland; the land of rainbows. Both photographs are again composites and as you may see, it was raining again (overall we had only very little rain during our three weeks though). However, the sun was shining at the same time and thus created this impressive rainbow - and the less impressive shadow of the photographer and his son (in the example above). When the rain approached and we realised what spectacle may follow, we were still below, next to the river that you see in the photographs (on the other side). We crossed the river (it was freezing cold), run up the hill, and arrived just in time for this view. The sun and rain changed constantly and the whole show was quickly over. We only managed two capture enough photographs for two panoramas. As you can see, the version below does not have our shadows and the lighting is very different; without the sunlight in the foreground and the rain and rainbow are further back. I prefer the version above, even though I am not sure if I like having our shadows in the photograph. Do you mind them? In either case, thank you for looking and reading and have a nice weekend! A photograph from our summer holiday in Iceland. We were most impressed by the weather; not because it was raining very often, but rather because we always saw rain somewhere (else). This scene was encountered and photographed moments before we did get wet (and the view had disappeared), but the car was close by. The photograph was actually composed as a panorama - it is comprised of seven individual photographs that were stitched. I thank all of you who are still "stopping by" at this blog despite the erratic posting rhythm and wish you a nice week (I try to return to a weekly blogging interval ...).